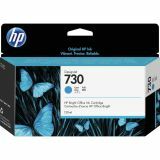 HP 730 Original Ink Cartridge - Cyan - Make an impression with clear, easily readable drawings and colorful, powerful presentations. HP Bright Office Ink is the ideal fit for technical document printing, providing bright color and bold image quality on plain papers. You get crisp, clear, accurate lines and vivid color, even true neutral grays, in the HP Designjet T1700 Printer series. Enjoy accurate, professional results, print after print, cartridge after cartridge. Work uninterrupted with trouble-free performance and fast-drying prints. Original HP inks maximize printhead life and help lower cost of ownership.